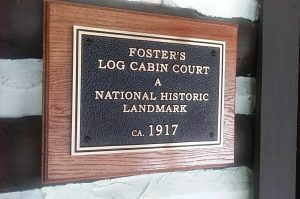 Foster’s Log Cabin Court is listed in the National Register of Historic Places by the United States Department of the Interior. The name was changed to The Log Cabin Motor Court in 1986. The court a remarkably intact example of a 1930s motor court associated with the trend of automobile-oriented tourism in the region. The buildings dating from 1917, features an intact collection of one-story Rustic Revival-style saddle-notched log cabins, a dining lodge, and associated structures that was one of the earliest tourist courts located around Asheville. Tall white and yellow pines, as well as dogwood trees, over the property in much the same manner as when the cabins were built. Set in its historic landscape, Foster’s Log Cabin Court possesses integrity of location, design, materials, workmanship, feeling and association. The Log Cabin Motor Court serves as a touchstone of the region’s tourism history, offering affordable accommodations in a convenient, yet rustic setting. In 1958 portions of the movie Thunder Road starring Robert Mitchum was filmed filed at this site. The cabins have been lovingly cared for by the current owners, John and Maria Maltry who have maintained the motto of the original owner’s in providing a “home away from home” for travelers from near and far. Creating a pet-friendly environment was important to John & Maria who love traveling with their dog Angel. You will find a fenced pet play area along with fenced yards around two cabins for the comfort and enjoyment of your pets. 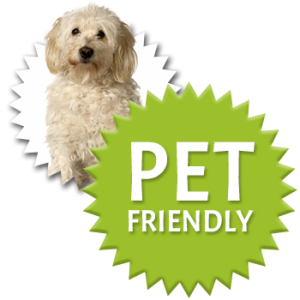 A pet free cabin is also available for our guests with allergies. Many memories have been created at the Log Cabin Motor Court – proposals, anniversaries, family reunions, birthdays and weddings. Our guests enjoy experiencing a piece of history while creating memories of their own.